March 17th celebrates the traditional date of death of Saint Patrick, the patron saint of Ireland. St. Patrick’s Day also happens to be celebrated in more countries than any other national festival! Crazy, right?! But for most people, it’s just an excuse to drink green beer, dress like a leprechaun, and eat traditional Irish grub! And an excuse for me to make cute kitschy desserts too! This year, I’m not waiting around to find a pot of gold at the end of the rainbow…I’m making my own pot of gold with these St. Patrick’s Day Golden Coin Cookies! 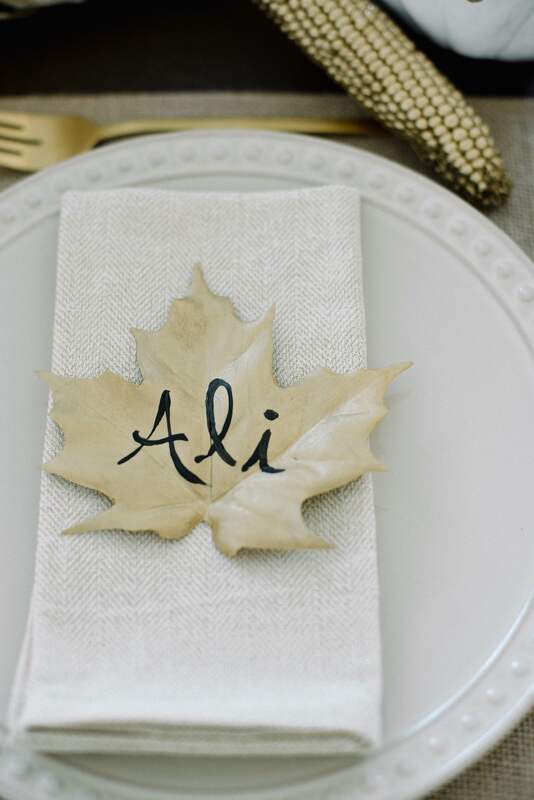 I’m keeping the DIY train going today and sharing another project from the gold Thanksgiving tablescape design that I shared earlier this week. And if you haven’t noticed, the DIY’s are all SUPER simple to put together. So don’t stress if you are hosting the big dinner this year. You still have plenty of time to put this whole design together with tons of time to spare! 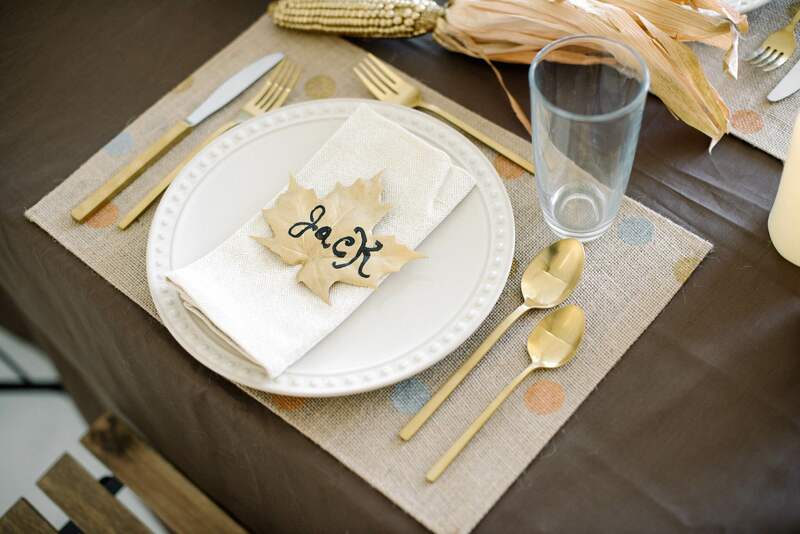 I shared how to make those metallic polka dot placemats yesterday, but the table design wouldn’t be complete without those pretty little gold leaf placecards! Thanksgiving is two weeks away (crazy!) and I couldn’t be more thrilled. I definitely look forward to all of the lazy traditions we have as a family. We usually head to our family home is St. George, a city father south (and usually a few degrees warmer than Salt Lake!). We spend the long weekend, sleeping in, making Thanksgiving dinner, and Black Friday shopping our little hearts out! Call us crazy, but we even head into Las Vegas on Saturday to find even more deals. We’re a shopping family, what can I say. Do you guys join in on the Black Friday craziness at all? I think my husband has the right idea…he stays in bed and does all of his shopping online! 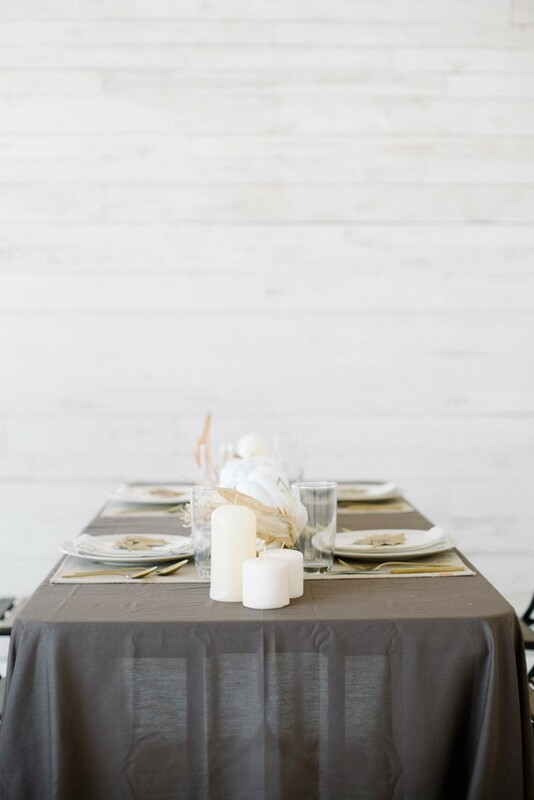 Either way, we always start out our shopping adventures with Thanksgiving dinner around the table as a family. It’s one of my husband’s favorite parts of the holiday and one that really brings everyone together. If you happen to be hosting dinner this year, maybe even for the first time, I’m sharing a super easy way to decorate your table using basic items that you can find at your local craft store and grocery store! 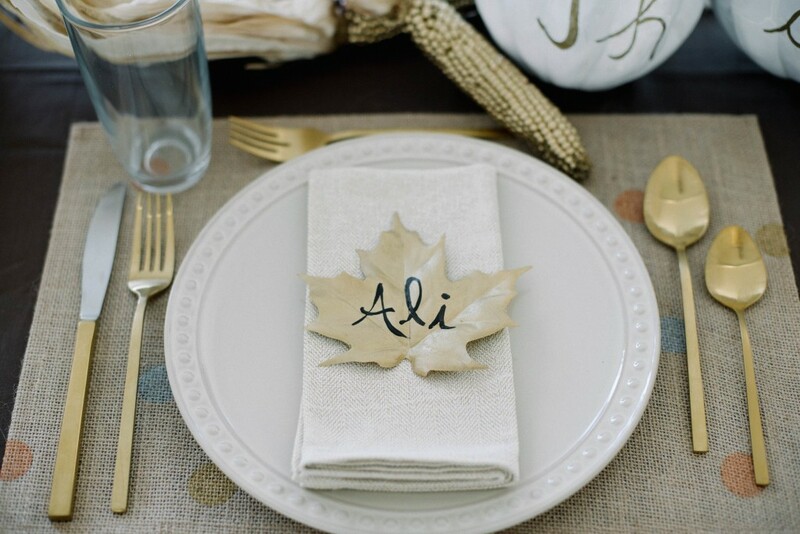 This gold thanksgiving tablescape is the perfect combination of rustic and glam and is a cinch to put together!